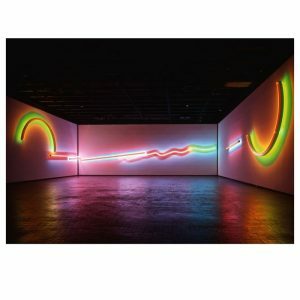 Opening in the Winter of 2018, the Neuberger Museum of Art will feature two exhibitions about neon that explore several artist’s use of this exciting medium as well as the close collaboration between the skilled glass-benders and the artists. Stephen Antonakos: Proscenium + Bending Light: Neon Art 1965 to Now is organized by the Neuberger Museum of Art, Purchase College, State University of New York, and curated by Avis Larson, Assistant Curator and Helaine Posner, Chief Curator. Generous support for this project is provided by ArtsWestchester with support from Westchester County Government, the Friends of the Neuberger Museum of Art and by the Purchase College Foundation.